What’s a museum trail essentially for? It’s to help visitors to make connections between ideas, to enable them to go on a journey through the content you’ve got in order to realise new things and potentially reach a new destination. 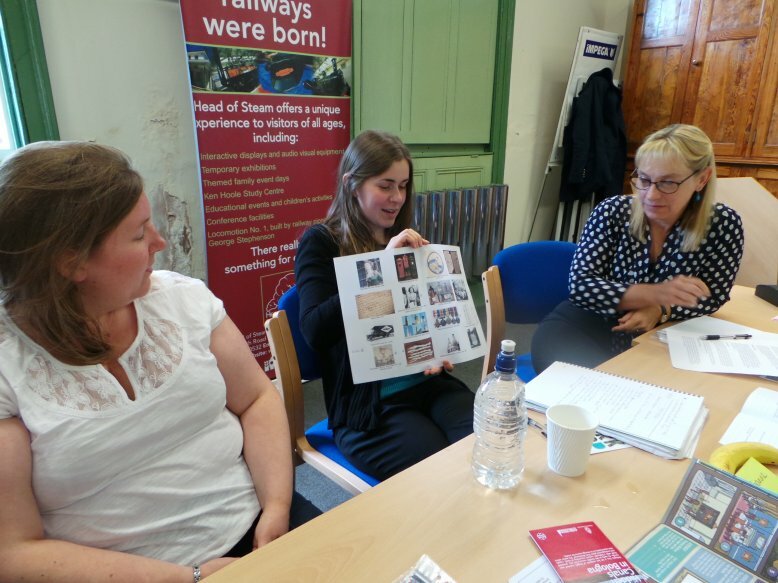 At this week’s Trails Textworkshop we worked in-house with the Making a Mark Partnership, a collaboration between seven museums in the Tees Valley and the National Portrait Gallery, advised by learning expert Jo Graham. 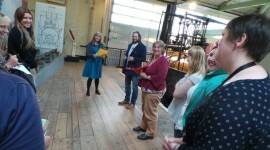 The workshop took place on a stunning day at the Head of Steam Museum which, on the route of the original 1825 Stockton & Darlington Railway, was a very fitting place to think about connections, links and journeys. To stoke up a creative frame of mind, everyone got into teams and tackled the first challenge – could you find something unusual that you all had in common within your team? One team of three quickly realised they were all called Joanne – an excellent start. Another team established they’d all visited Amsterdam. The third team were known for their excellent biscuit making. And the fourth team loved gardening. Then the teams tried out a new connections game that I had previously trialled with the Book for Breakfast reading group at Dashwood Banbury Academy. The idea is to explore 16 different pictures chosen from around the world, and all through time – selected from my recent museum projects. 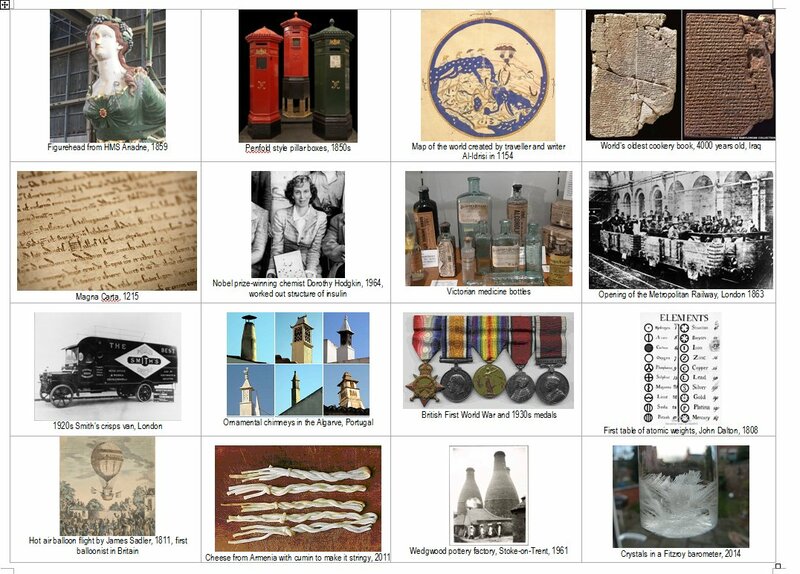 It includes pillar boxes, a map, a historic hot air balloon flight, medicine bottles, stringy cheese and the oldest cookery book in the world. But what connections could the teams make between these seemingly far-flung items? The results were very interesting. 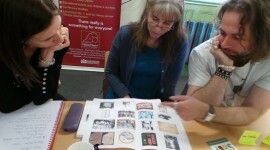 Team Joanne linked several objects via the idea of writing, fonts and design and how they have changed through time. Team Garden explored the idea of experiment and risk. 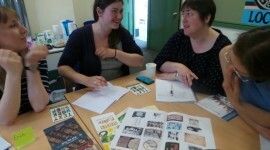 Team Amsterdam liked the idea of chemistry and cooking and played on the objects relating to recipes and food. Finally Team Biscuit picked up on the idea of travel and transport, connecting objects through the idea of adventure. 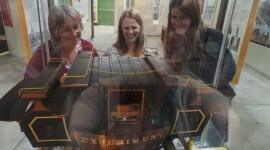 I also then threw in an extra challenge, to incorporate something on display in the Head of Steam Museum itself. 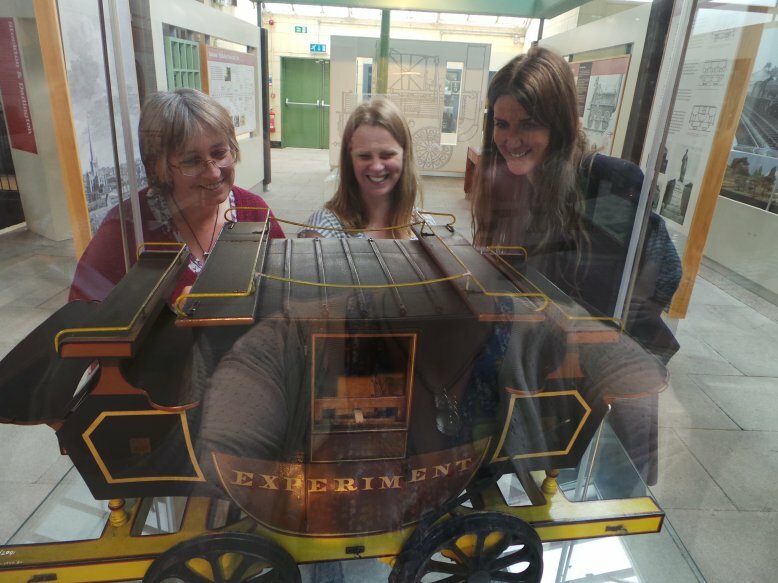 Soon each team was linking their journeys with objects including a souvenir Tin of Steam, a pair of plate-layer’s clogs, and the star exhibit in the museum, Locomotion No 1, which hauled the first train on this historic line on 27 September 1825. 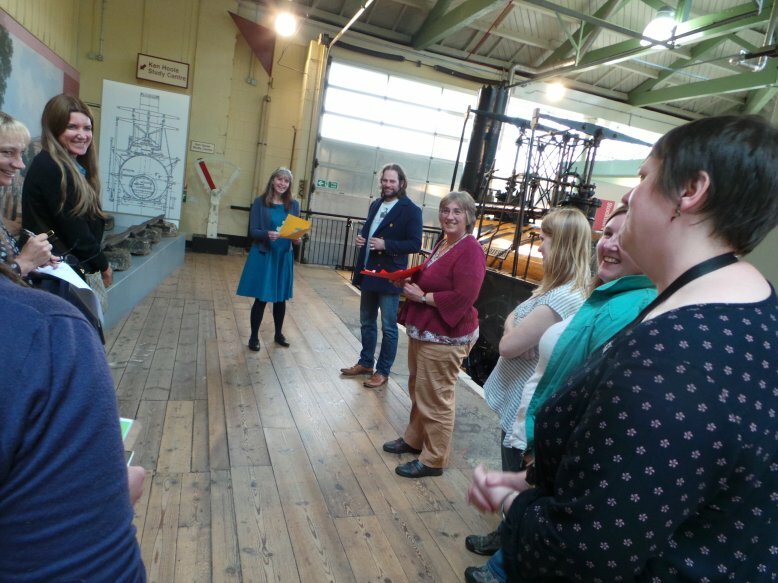 With the teams’ inventive capacity now running at full tilt, we shared TextWorkshop’s Seven Secrets for Great Trails Text before getting out into the displays to write some trails of our own and try them out. The teams started with the themes they’d chosen earlier, and branched out from there – creating new connections and taking some unexpected journeys along the way. Actions people plan to take as a result of the training were great to hear. 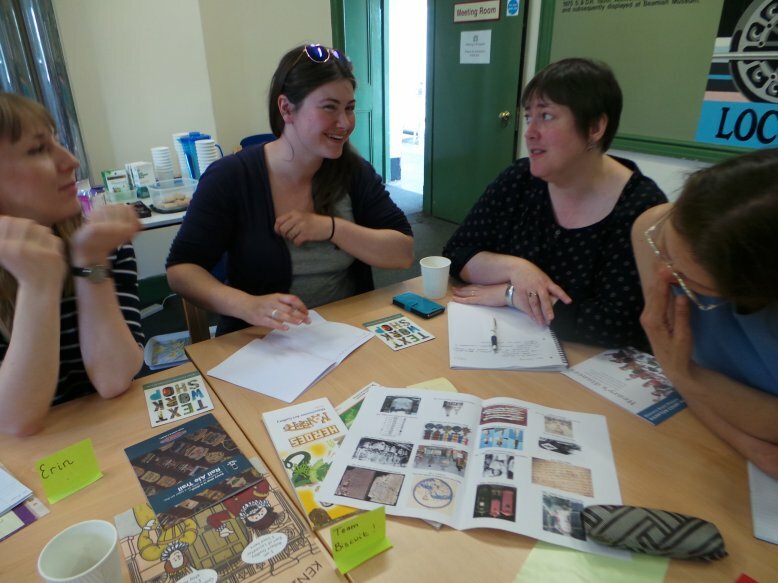 New trails for younger children, ‘building detective’ trails, a trail of the story of Hartlepool and trails created using TextWorkshop tips such as the wordy warmup, are all now under development. 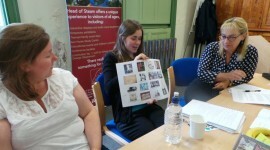 We look forward to hearing more about the trails and stories created by the Making a Mark teams.